Last weekend we attended San Diego Comic-Con once again, with the primary focus of networking for the charity and getting on the radar of folks who may want to contribute videos or auction items in the future! We are happy to report that with the help of many CGL friends, many pieces of memorabilia that will be featured in our upcoming charity auction were acquired during this trip! As a reminder, our online charity auction (hosted by Blacksparrow Auctions), opens on September 1, 2014 and runs through September 27. The auction is open to anyone around the globe, and proceeds benefit the American Cancer Society! 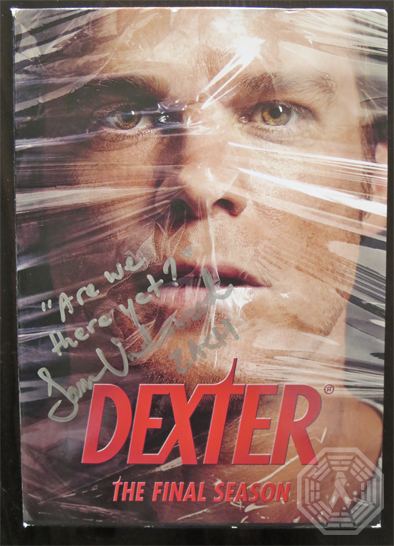 Sam Underwood, currently starring as Luke/Mark on The Following and formerly Zach Hamilton on Dexter, kindly signed this Dexter: The Final Season DVD for our auction! 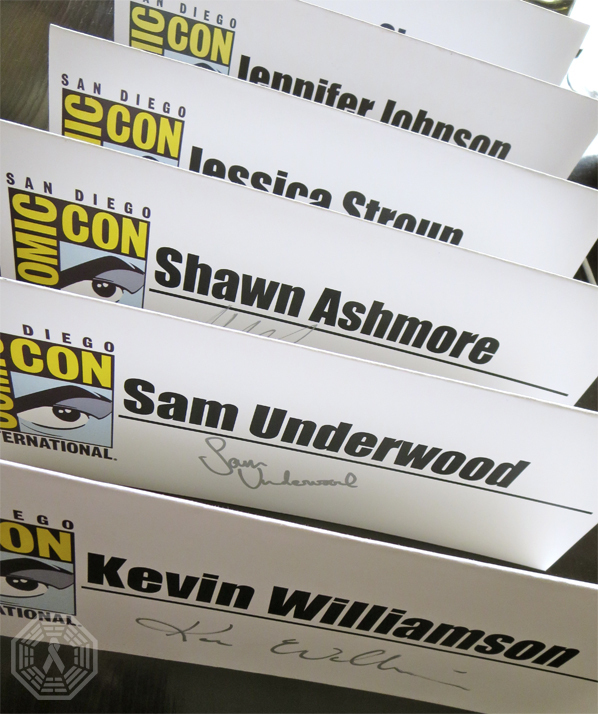 In addition, Sam also arranged to get the SDCC 2014 name placards signed by his co-stars and show runners from The Following for us! 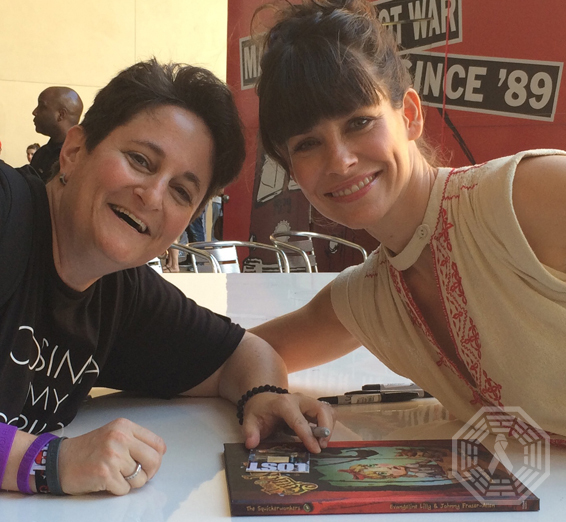 Just as she did at SDCC 2013, the very sweet and generous Evangeline Lilly (Kate on LOST, Tauriel in The Hobbit, soon to be Hope in Ant-Man) signed a copy of her book The Squickerwonkers for our charity auction! We will have signed copies of both last year’s soft cover version and this year’s hard cover updated version of her book in the auction. 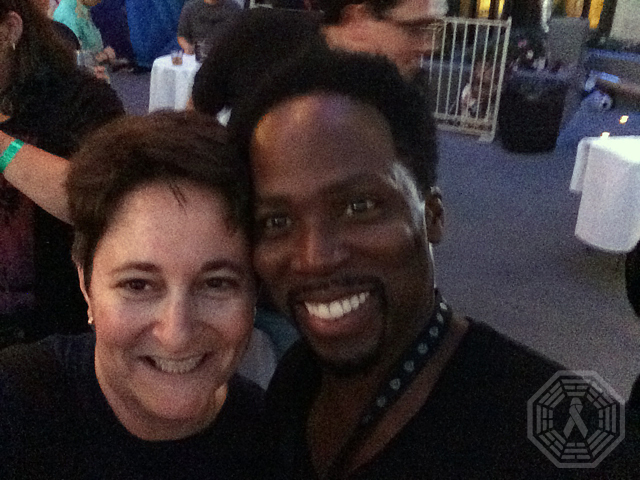 In other LOST-alum related news, Jo was also lucky enough to run into Harold Perrineau – who was at SDCC promoting his new show Constantine. Although he was literally running from one event to the next, he took the time to sign a Michael & Walt costume card for the auction! We are so grateful to those behind and in front of the camera in the film/TV industry that continue to support our cause; their contributions significantly elevate our auction offerings and fundraising opportunities. Stay tuned for many more auction updates and instructions this month!